The candle mould is made by our parent company Linic Plastics Ltd, here in Fleckney, Leicestershire. 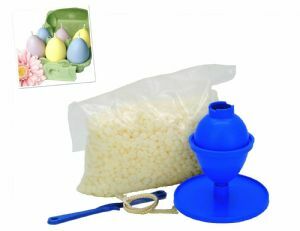 This kit is great for beginners and contains enough wax and wick for you to make 3 egg candles, whilst the candle mould and wick holder can be reused again and again as they are made out of plastic. The mould itself comes in two pieces which click together with a pouring hole at the top. The candle wick holder is 4" in length and made from rigid plastic. Includes 1 metre of wick. 240g of wax (enough to make 3 egg candles, as approx. 80g of wax is required per candle). This candle wax is manufactured by Kerax, a leading UK wax manufacturer. Kerawax 4105 combines the unbeatable scent throw of a paraffin wax with the creamy appearance and marketing benefits of clean, natural palm. This wax is ideal for beginners as it is easy to work with to create professional candles. As with most wax, it usually requires a second pour but the hot and cold scent throw is very good, as is the glass adhesion. This kit contains instructions and some useful tips to make sure you get great results. Please note that you will only receive the products to make egg shaped candles and the candles are for display purposes only. We also have the same wax for sale in bags of 500g and 1kg if you would like to make more than 3 candles, as well as spare wick.